Bedtime Stories: What Do You Remember? In a poll of 2,000 British mothers with children under the age of seven, only one in five said they read a book to their child every night. In fact, 36 percent of parents don’t read bedtime stories to their children at all. What are your memories of bedtime stories? We all have them … sorta! True, our memories of bedtime stories might not be what our parents think or remember. Why is that? Well, let’s just say that while bedtime meant bath/bedtime stories/sleep for adults, perhaps it meant bath/bedtime drift off to sleep/deep sleep for little kids. I grew up in a house full of books. My Dad was an avid reader, and my Mom loved her magazines, cooking books and esoteric novels. Yet, when I think of books and my earliest memory of them, I remember, vaguely, being read to by the fireplace on a cold winter’s day or curling up in bed with my mom on a Saturday morning to share a book. What about bedtime? What about all the books shared in the collages above and below? I read them alright but, not necessarily at night. My daughters had some insights for me. I remember buying and reading almost all of the classic, popular books featured in this post, and we still have many of them on our bookshelves at home. But my kids remember it differently. When I asked them for their favorite bedtime stories/memories, they assured me that they read all these books … by themselves! Em mm. How could that be possible? Oh, they remember bedtime alright but, they remember taking a bath, playing in the bathtub with their rubber ducks and bath toys, being playfully chased down the hallway, getting their hair brushed and getting tucked in bed. And those bedtime stories we thought they were listening to? Let’s just say they were counting sheep in La La Land as we droned on about Peter Rabbit and Mrs Piggle Wiggle. Above and below are collages of some books I recall. What really goes on at bedtime and what about bedtime stories? You see, when I read the poll conducted with 2,000 British moms above, I was mortified. How could parents not read to their little ones at night? How could 4% not even own a children’s book? Frankly, given our modern day, two working family homes, it come as no surprise that bedtime might just be that … time for bed. It also doesn’t surprise me that kids, after a long day of activities, play dates, prep classes and whatnot, remember the pre-bedtime activities more than the cuddly night time read of say, Goodnight Moon. If we stopped to really think back to those early years, we might also remember that we had time restrictions and a need to unwind after a stressful day. It’s not that parents don’t read to their kids anymore, and it’s not that our children don’t have memories of childhood books, it’s just that opinions differ on when those books were read. It’s a matter of our separate memories of the time of day that books were actually read/shared. But what about all those books we bought/believed we read to the kids … at night? My daughters said: “Look Mom, our memory of reading books kicked in around 3 years of age and, by then, we could read our picture books and understand them.” Okay, so they did internalize the reading sessions we shared and because we read books together (Forget bedtime: we know they weren’t paying attention because they were sleepy), they became early and avid readers themselves. As I thought about our exchange, I traveled back to my childhood memories of reading and, just like my kids, my fondest memories were of curling up in my Dad’s Study and pulling books off his shelf to read. Back in the day, you could purchase a set of leather bound classics to create a home library. My Dad had a wide range of books and it gave me enormous pleasure to pluck a book off the shelf and attempt to read it. Some of the books were more challenging to read, and I would skim and infer what was intended as I read along. As I looked through the list of books featured here, I was drawn to a few that were solidly part of my childhood reading, Winnie The Pooh, Peter Rabbit, Wind In the Willows, Paddington Bear, Madeline, Corduroy, The BFG, Goodnight Moon and some others. I remember all of them fondly and how much pleasure they gave me, and I am pleased that I shared my love of books with my children. Bedtime or not, they are still avid readers. What about your memories of bedtime stories? What do you remember? Did you read bedtime stories to your kids? Which ones were your/their favorites? As I was reflecting on books to include in this post, I found myself thinking about how our memories are created and what people cherish most: We capture snippets of moments and build new memories around them. I was a shy child so books formed a formidable part of my memory bank. My kids love books, video games, TV, music and technology; snippets of those interests infuse their memories of childhood. Often, what is remembered is the emotion; the love, warmth, struggle, and life’s ups and down tend to linger longer … and they all make for good reading. In researching books for this post, I came across two articles that were a great help in jugging my memory of favorite books. They are: 50 Books Every Parent Should Read to Their Child AND 15 Classic Children’s Books That Started as Bedtime Stories. Check out their recommended books and add a few more to your list. Is there a book that you don’t see mentioned or featured that was part of your childhood? Do tell. As Marcel Proust said in the opening quote of this post, “There are perhaps no days of our childhood we lived so fully as those we spent with a favorite book.” What was your favorite book? What memories do you have of yours? Do share! My fellow bloggers were equally creative with their selections. Check out how others interpreted the theme – Bedtime Stories – below. This post was inspired by a prompt from WP Daily Post: Bedtime Stories – What was your favorite book as a child? Did it influence the person you are now? Positive Motivation Tip: Books and reading conjure up all sorts of memories or none at all for us… We choose what we want to remember… Whatever we recall, let’s cherish the memory. It is the emotion that is evoked not so much the bedtime storybook. I love this post! We didn’t own a lot of books at my house, but my brother, sister, and I TREASURED our Saturday morning bus ride to the public library where my mother would drop us off in the Children’s Room to choose a book each, while she headed to the main section to pick out her books for the week. Those trips made me a reader. And a writer. As a teacher for 35 years, not one day went by that I didn’t read aloud to my 2nd, 3rd, or 4th graders. It was hands down my favorite part of the day. That is so cool. I remember my Dad would take us to the library and basically let us loose. We read so many books. I’m glad my kids have taken the same interest in reading as I did. I’m glad too… same here. I remember a lot about my mom reading to me when I was little. My first favorite as a toddler was “Jim Jump” and she can still recite most of it by heart! I’ve shared this post everywhere, Eliz! My favorite time as a child was always a time when I had a book in my hand. I’d walk home from the library with so many, I looked like a walking stack of books. My mom did read to us every night, I read to my kids every night, and either I or my daughter read to her son every night. He is six and can read them himself, but he still loves to be read to at bedtime. It is that warm, cuddly moment at the end of the day when all is right with the world, no matter what. As to which are my favorites? Your collage has them all…except perhaps Caps for Sale, which I love also. Good night moon is a fave of mine. I read it to all of my children as well. It remains one of mine too… such a beautiful book. I remember so many of these books. I even have a few put away for when I have my own kids! Good for you! Did it last? Although I don’t remember doing this, my Mom reminds me frequently when she is lamenting that my niece might not be reading to her daughter enough. At bedtime, I used to pluck out three or four books and tell her or my Dad to read each one of them a specified number of times–they did–I stayed awake–they fell asleep!! But now I am an AVID reader!! Oh my goodness. I laughed out loud at that one!!!!! So true. This brought me back to my childhood! Reading was always an important part of my upbringing and is still a favorite escape for me to this day. Thanks for reminder. I regret to say that I wasn’t able to take advantage of the years when my kids are still small. They love listening to bedtime stories. I’ll try to make up. Those are great choices. My kids like Good Night Moon, very fitting for bedtime! I am one of those who didn’t have bedtime stories read to them. I made sure that was not my daughter’s experience and I now see that my granddaughter is getting her full share of bedtime stories. So many great books. I’ve been looking and buying ones at Half price Books lately that I remember from my childhood. I remember more of what I read to my kids than what was read to me. It’s fun now to see my son read the same books he loved to my granddaughter. I have read so many of these books to my kids (or read them myself). Probably my favorite that I saw was “Goodnight Moon”. One I loved but I didn’t see was “Is your Mama a Lama”. Nothing beats a classic Dr. Seuss book, they are tons of fun! I don’t actually have a favorite. All I remember is that I had a big picture book of famous fairy tales and nursery rhymes. I liked the story of Jack and the Beanstalk. I have so many and they were a great comfort in childhood. I remember these stories. My mom read to us until the time that we can read on our own. I also did this with my kids. It’s sad to know that most parents now are not reading stories to their kids at bedtime. I remember my mother, who was very keen on efficiency, or her version of it, used to put a classical music record on the player in our room, reasoning that we were bound to be asleep by the time it finished. You have to smile really, because she possibly missed one of the key qualities of the bed time story, which is sharing, of course. Hahaha! According to the UK research post, she did better than most. I don’t remember being read to when I was little, but I do read to my little ones. They LOVE Curious George books and anything about animals. I remember reading most of these books, but I was never read to before bed. 4%?? I’m shocked. I guess it’s too easy to assume most parents are in the habit of reading to their children. I always did and I really thought every one else did as well. I remember quite a few of these from my childhood. I used to love “Goodnight Moon” especially. We couldn’t afford to buy books during my childhood days. Instead my mom or dad will tell a story about their life back then or sing us a song. I miss those days when children had moments with parents and not by technology. Such a wonderful topic, this makes me think of the memories of a bedtime stories. All I know is that I don’t have a favorite because whenever my father tells a story it something the he made up… or if my mom tells a story base on a true one, its quite scary too. We share the same passion in reading. I’m also a voracious reader. I don’t have the chance to read these bedtime stories before but I started my love of reading with our collection of Bible stories that I just understand by just watching the photos. I remember, I couldn’t sleep during siesta or afternoon nap if I won’t read at least one story from any book because it helps me fell asleep. Then my love of books develop when I learned to read. I’m so ecstatic before when I receive a bulk size of pinoy comics from my grand aunt and I’d sneek to the market to rent comics or pocketbooks until my parents caught me. After that, I’ll just settle at the school library and just read any books that interest me especially old stories. Those are my childhood memories. This brings memories such as Dr. Seuss bed time stories and Winnie the Pooh. I remember a lot of Peter Rabbit as a kid. I also loved (and still love!) Dr. Suess. Sad to say, My mom never told me any bedtime stories. My daughter has been reading The Giving Tree before bed every night. It was my favorite book when I was her age, and I love seeing her enjoy it now. We read a lot of books. We go to library once a week and someone always has their head in a book. I’m British and a Mum and shock horror one of those people who doesn’t read bedtime stories. My eldest usually reads to the youngest and reading is something that encompasses our day not a bedtime routine. Seeing as academically they do well in English I’m not concerned. Enid Blyton, Jeremy Strong and JK Rowling are particular faves at the moment. I feel the same way. As long as they are reading, time of day is irrelevant. I don’t remember my parents telling us bedtime stories when I was a kid. Parents remember but most kids don’t. You brought back beautiful memories of long ago I liked Pippi, Winnie Pooh, and many more great times fill sitting under a tree just reading away. But what I like most is when my sister read at bedtime. Thank for sharing. You should share this with your sister… Beautiful memory. I remember reading Dr.Seuss when I was young. Other than that, maybe a few Golden books, but that’s about it. I remember the Golden Books too. They were a cheap and easy read. Chitty Chitty Bang Bang was my favorite when I was little. My sister and I could read this for hours. 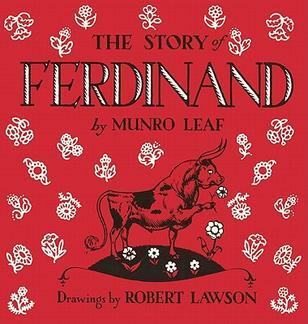 Oh my gosh Ferdinand caught my eye. I think I still have that one on a bookshelf somewhere. I have great memories of reading with the kids before bed. Our home is a library seriously but I love books and so do my five kids. We have everyone of these and we read every night aloud together. Revisiting your site. I loved looking at all these pictures that remind me of my childhood days. It was such a good time! Thank you Eileen… I loved disappearing in all those books too. I remember my mom telling me bedtime stories in Greek – they were old Greek fables, and some Greek mythology. Wonderful… you should get her to share the stories again and translate them. We have a lot of these books! This is a great roundup of a lot of good ones. I have read a majority of the books on your list. My favorite are the Cat in The Hat. Goodnight Moon was one of my favorites!